In an era when most brands are concerned with following the trend, we provide something quite different; a thoughtfully balanced palette of colours, for true seekers of beauty, who choose beauty over brand name or fad. I am looking for a blush that enhances my cheeks, that doesn’t shout blush, with a matte but not powdery finish and with Rouge Bunny Rouge I am in the right place. I actually find the packaging practical and trendy but for the price tag it could be a little bit more luxurious… or it could contain a bit more product ! The case is 1cm high, 5.5cm diameter with a big mirror inside, it contains 3.5g of product for 25 Gbp (I think, because I got mine without VAT so it reduces the price to Gbp 20.83). An European version of a Chanel blush is 4g and costs 31Gbp, now you know that Rouge Bunny Rouge is a very expensive brand indeed ! I am sad but also lucky they don’t have more shades available because I would be tempted to buy them all ! Today I have all their shades from their Original Skin blush range. I stick white labels with the names on the side because of the way I store them, it helps me to pick them up more easily. Rouge Bunny Rouge started in Russia in 2006 and even if I find their prices too high, I find most of their products to be extremely good and worth the price tag. Original Skin Blush blends with a sheer, silky touch for a naturally luminous glow. A medley of active ingredients, including Uhaloa from Hawaii, also known as Velvet-leaf and modern technologies impart a long term brightening effect. Indian Gooseberry Fruit Extract stands guard against free radicals. Sheer pearls amplify the creamy soft touch and ensure a limpid glow. 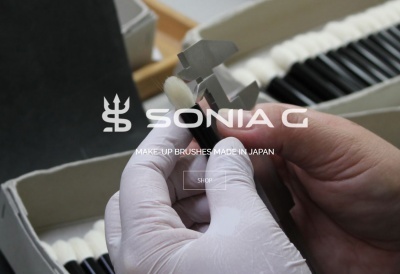 Innovative powders entwine with your skin to preserve perfection all day long. 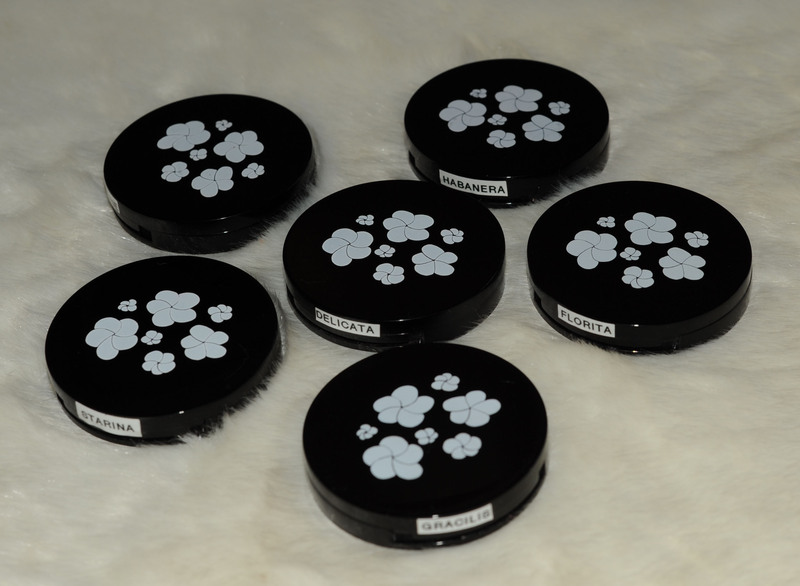 I could not wish for a better powder blush finish, feels wonderful on the skin, pure silk. My favorite is Orpheline, not a surprise since this one is a staple and its shade and texture deserve all the raves. Delicata is too light for me, it disappears on my NW20-25 skin, I use it when I want to tone down some other cream blushes, or if I want a no-blush blush, just evens out the skin. Florita is the darkest of them all, very long lasting. Starina I tend to use it more like a highlighter than a blush, this one seems to be the more “glowy” of all their range. Gracilis, this is the kind of cheek colors that I don’t usually like to wear, but the silky finish of this blush makes it a gorgeous cheek color, it blends on the skin without leaving an artificial powder finish. I use it when I do grey smokey eyes and with Tom Ford Pink Dusk lipstick, the combination is perfect, balanced, flawless. Habanera, the swatch on the picture is very heavy, it doesn’t show up as dark on the cheeks. I was afraid it would be too orange but it’s not at all, I use it to contour as well. 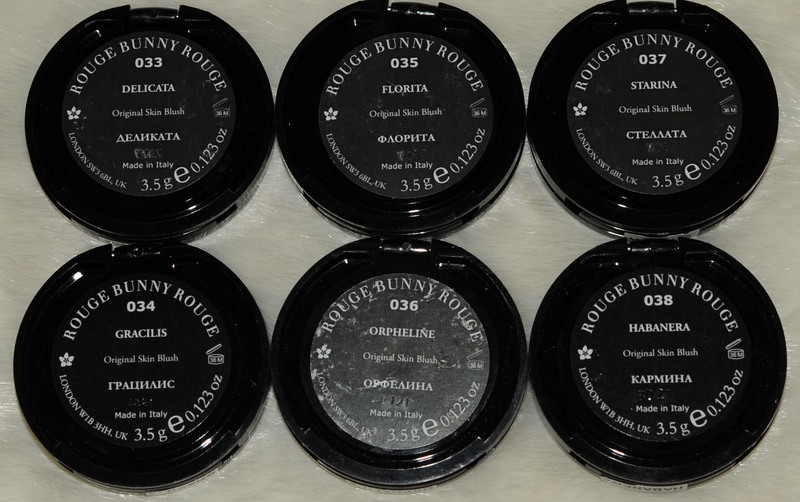 Florita, Orpheline and Habanera are the darkest and therefore the more long lasting. I just love them all, I can use all the shades and the matte, but still non-powdery glowy finish, makes them appropriate for any age, any occasion. 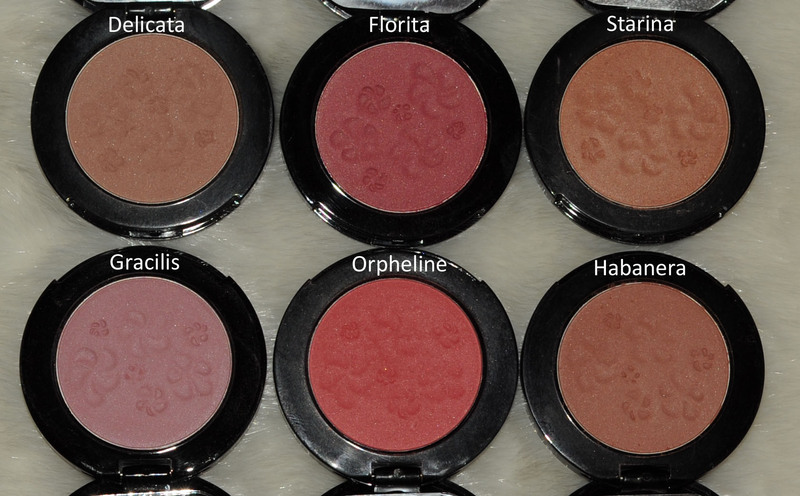 Rouge Bunny Rouge – For love of roses – Original Skin blush swatches was last modified: August 18th, 2013 by Sonia G.
I can only use Delicata as a contour color on my NC25 skin. On the cheeks it’s just too subtle. 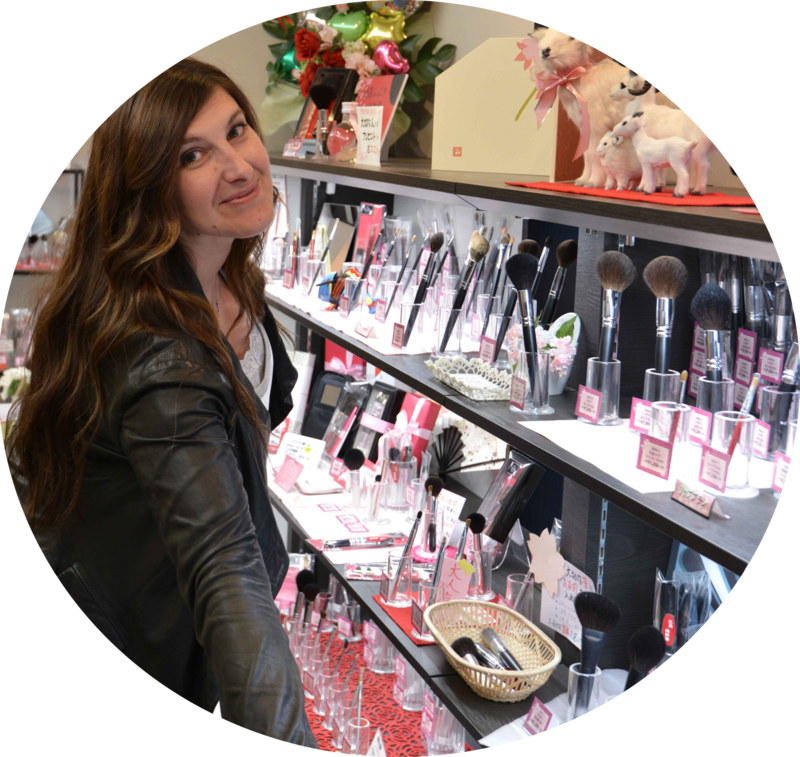 I hope you’re going to love the RBR contour brush. It’s my very favourite for a soft cheek contour. 🙂 today it’s Gracilis – Pink dusk – Grey smokey 🙂 love that !!!! I think I will love the RBR contour… it’s the one I wanted from the beginning but every time I wanted to order it, it was sold out. Ok so now I had to run upstairs and see which RBR blush I have because I don’t give it enough love! I would have sworn it was Gracilis but it was Delicata which I promptly added to my TF Frantic Pink just because I had to. Not only do a value your posts Sonia for all of the incredible information but also it makes me remember some of my neglected lines!! I should have Gracilis and Orpheline! I think I will have to correct that over site! Also I need to go to the Mac counter and get foundation matched so I can talk the MAC color talk! 🙂 sometimes I look inside my drawers and I find the urge to write about something I love 🙂 These are nice little gems ! I can wear a warm, dark grey in the crease but then I need a bright ‘pick-me-up color ‘ on the rest of the lid. The strange thing is that grey clothing & scarves suit my complaxion well?! I like to use Chantecaille or Suqqu greys most of the time. This saturday I have a full day training with a photography teacher, I am not sure that this will help for the kind of pictures I want to take but anyway.. it’s a start … as soon as I am able to take decent pictures I will share that with you ! 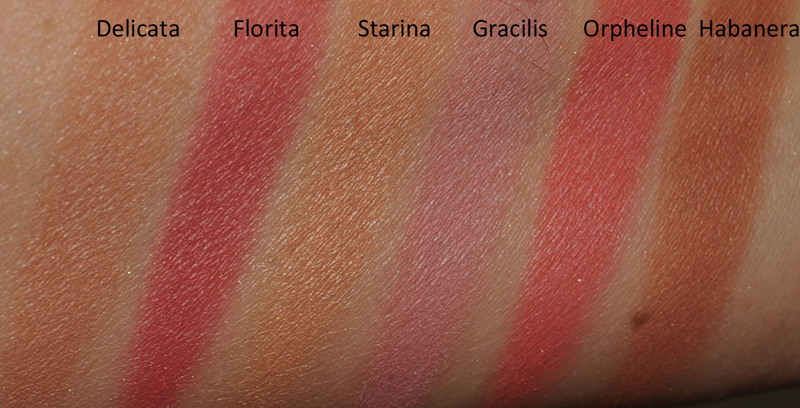 Gracilis is really nice, I love mauve blushes as they seem to neutralize redness on my cheeks. Nikoleta, I didn’t realize they weren’t shipping for free outside the UK. Darn! Yes Sonia, do share your shades of grey with us 😉 Seriously the favorite eyeshadows and a picture of your smokey eye will be wonderful! Your photography class should be so interesting! I am sure this blush must look good on you ! you look impatient to get to fall 😉 by the way, I had such fun reading your Fall post ! Thanks good news about the free shipping to Europe, Michelle. I was going to get some of my Russian colleagues to buy some RBR products for me when they go home on hols but this is much better! I’ve just placed my first order at RBR, taking advantage of the last chance sale to pick up two kohl pencils (so practical for fast fast last minute touch-ups at work!) in colours I’d like to use but don’t have as well as the free shipping to Europe. By the way, the free offer is only til 5 May. It’s super nice that they give non-VAT price for international customer. Hi Michelle! I recently got the RBR fragrance Lilt after trying samples of all three. It is a beautiful fragrance, very different than anything I have… All three are very well done in my opinion, very elegant and “expensive” scents. I had read that they blend well together so I tried the Lilt with Chatoyant and the result was gorgeous! The bottles are to die for, amazingly well done! The are frosted heavy heavy glass that I swear are worth the purchase price just to look at 😉 You will have to let us know what you end up getting and what you love. If I remember correctly the RBR website was offering a free trio of the fragrances with an order recently. Unfortunately for me, being in the US I can’t order the fragrances directly from RBR so I stick with BeautyHabit. oh let me know how you like the products ordered ladies! I am very excited about trying this brand. I bought the lip gloss in Come Here Sweetie, as the girl from Delicate Hummingbird blog had it on in a photo and looked so pretty. hey, what happened to her as I am late and only discovered her blog a few months ago and learn something new everyday from the blog but she is not blogging at this time? I also got the blush wand in Titian, hoping it looks good on my pale skin and the time defying foundation in Linen.